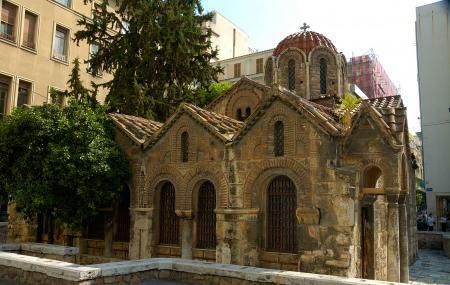 Find hotel near Church Of Panagia Kapnika ..
One of the oldest churches in Athens, the Church of Panagia Kapnikarea was built sometime during the year 1050. It is also one of the most important Byzantine monuments in Athens. With striking architecture, this quaint church is a must visit. Do check out the mosaic of Madonna and Child. This church is thought to be built on the ruins of an ancient temple probably dedicated to Athena or Demeter. As for the architecture of this place, it is a four column type square housing three apses on the east side and a narthex on the west. Visit here is a must for a spiritual as well as architectural retreat while you are in the city of Athens. It is an active place of worship, appropriate clothing is required. Photography within the church is prohibited. How popular is Church Of Panagia Kapnikarea? People normally club together Eleusinion and Ilias Lalaounis Jewellery Museum while planning their visit to Church Of Panagia Kapnikarea. This church is a beauty! Unlike any other church I have seen in the entire world. The old murals on the walls and ceilings are so beautiful. Each one tells a different story. I am so glad I went inside to have a look. There were a lot of loud street performers right next to the church. When I went inside, it was truly calming and peaceful. This whole area is a tourist's dream come true. Photo ops abound. People are nice and you are ignored to go about the business of being a tourist. Lots of musicians doing their thing. Loads of shops and restaurants. I'm a fan of being so close to historic buildings and being able to literally touch them. Super cute church although I was unable to go in even though I walked by at two different times. Picturesque place to catch your breath while strolling up an down Ermou street.